My son, Blake, asked to be a fish tank for Halloween this year. He is a fish hobbyist. He has a 55 gallon fish tank in his room that he loves dearly! I'm sure that is where hid idea came from. The Angler Fish was inspired from the movie, "Finding Nemo". We decided he was just creepy enough for Halloween! We covered a bicycle helmet with plastic grocery bags and masking tape to create the shape. Fins were cut from cardboard boxes and attched with masking tape, the light was attached to floral wire with masking tape. After the Angler fish form was made, we covered with paper mache', let dry, and painted it using acrylic paint. We created the fish tank completely with cardboard boxes covered with electrical tape, cellophane for the glass, and contact paper. We attached some lightweight black material to the back of the costume to cover his lower half. 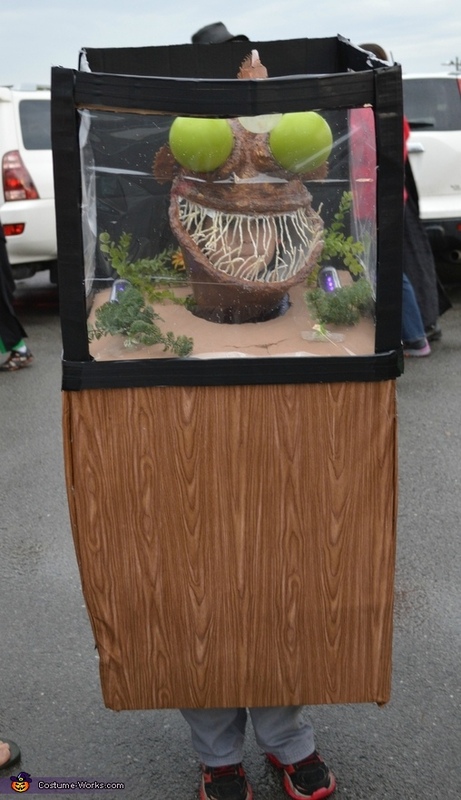 We went to several Halloween Events around town, and The Angler Fish costume was big hit! Lots of giggles, and picture requests! My son loved all the attention, and extra handfuls of candy he got for having a unique costume!